The government may need to borrow more to fund capital spending if the UK's economy is to recover, Business Secretary Vince Cable has suggested. Writing in the New Statesman, he said the danger of slow growth may now be greater than the loss of market confidence through increased borrowing. Mr Cable said the "balance of risk" had changed since 2010, when the coalition made deficit reduction central. The comments come ahead of a major speech by David Cameron on the economy. 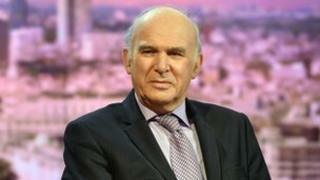 Labour said Mr Cable was finally "seeing sense" about the "economic consequences to deep cuts to capital investment". The BBC's Political Editor Nick Robinson said Mr Cable's argument was not new, as he had been calling for extra borrowing to pay for house building and other targeted growth measures for some time. But he said the timing, less than two weeks before the Budget and with the government under increasing pressure over the slow pace of recovery, was significant. In the article, the Lib Dem cabinet minister says the balance of risk between borrowing more and maintaining the confidence of the markets "remains a matter of judgement". But he adds: "There is a body of opinion arguing that the risks to the economy of sticking to existing plans are greater than the risks stemming from significantly increased and sustained public investment targeted at those areas of the economy where there are severe impediments to growth - housing, skills, infrastructure, innovation." In a challenge to Chancellor George Osborne's central argument, Mr Cable says debt-funded capital spending "would not undermine the central objective of reducing the structural deficit and may assist in reviving growth". He says it is "absurd" to say that capital spending cannot be greatly expanded, pointing to pre-recession programmes which saw the government spending £20bn more a year on infrastructure, schools and hospitals than it is doing now. He says the £5bn increase in capital spending that the government announced in the Autumn Statement by switching funds from departmental budgets was "modest" and "in the short run it has little effect on demand". He adds: "The more controversial question is whether the government should not switch but should borrow more, at current very low interest rates, in order to finance more capital spending: building of schools and colleges; small road and rail projects; more prudential borrowing by councils for house building. "Such a programme would inject demand into the weakest sector of our economy - construction - and, at one remove, the manufacturing supply chain (cement, steel). "It would target two significant bottlenecks to growth: infrastructure and housing." While many Conservatives claim that more borrowing would risk market confidence in the government's economic strategy, Mr Cable says "nobody knows how the markets might respond". Shadow Treasury minister Chris Leslie said: "Now is the right time to bring forward infrastructure investment and build thousands more affordable homes. It would kick-start our flat-lining economy, create jobs and in the long-term strengthen our economy and help get the deficit down. "Labour, business groups and even the International Monetary Fund have spent the last two years making the case for this. "If Vince Cable is finally coming round to that view he needs to start winning the argument round the cabinet table." Nick Robinson said Mr Cable's article had been approved by George Osborne's advisers and the business secretary was clear that he did not support Labour's broader call for the pace of deficit reduction to be slowed and for tax cuts to stimulate demand.